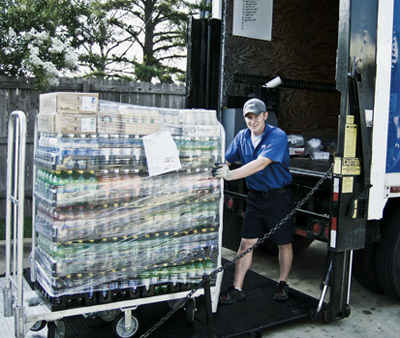 A folding aluminum truck that makes bulk delivery a breeze. 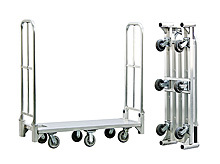 Load stock carts at the dock, unload at various delivery points, fold and store for next truck load. Zero turning radius, sturdy welded construction with solid integrated deck, and a vertical storage footprint that saves space when the delivery truck is empty. Lifetime warranty against rust and corrosion. Capacity: 1,200 lbs. Aluminum Platform Truck w/handle - rubber mold-on wheels - 24" x 48" x 10.5"